It allows you to reach San Pietro, the Vatican Museums in 5 minutes, Piazza di Spagna, Trevi Fountain and the city center in 10 minutes. for a total of 5 beds. In front of the entrance there is a large and green terrace with table and 6 chairs where it is possible to relax after a day spent in the center of Rome. The eat-in kitchen is fully furnished and equipped with fridge, freezer, electric oven, toaster, pots, plates and cutlery. The bathroom has a bathtub, the comfortable environment allows you to spend a pleasant and relaxing holiday. Services in the area: The holiday home 'Il cortile di Anna' is located in a quiet and well-served area. In the immediate vicinity you will find two restaurants, two pharmacies, a multiplex cinema, a bank, a playground for children, food shops and a supermarket. We were so pleased with our stay in Anna's beautiful home. It was clean and comfortable for 4 guests on our week vacation in Rome. 5 minute walk to the Metro station (Battistini), grocery stores, with delicious restaurants and Gelato around the corner. While the home does not have air conditioning, there are big windows and fans provided. Anna very nicely arranged a taxi for us to and from the airport. Highly recommended! I would stay at Anna's place anytime I am back in Rome. Anna's place is very spacious, close to bus and train (about a 5min walk). There are many shops, restaurants and supermarkets close by. Anna is always available and very helpful. We were comfortable and made breakfast every morning, then went out to explore beautiful Roma. Anna's apartment proved to be a great home base for our Rome adventure. As represented the apartment was clean, well-stocked and a short walk from public transportation. Anna was quite helpful--even letting us leave our luggage prior to check-in so we could get on with our exploring. Thank you for everything Anna!! Wonderful base for exploring Rome--not in the historical center but with a subway stop about 500 meters away great for exploring the city. We were there for a month--4 adults--and had plenty of space. 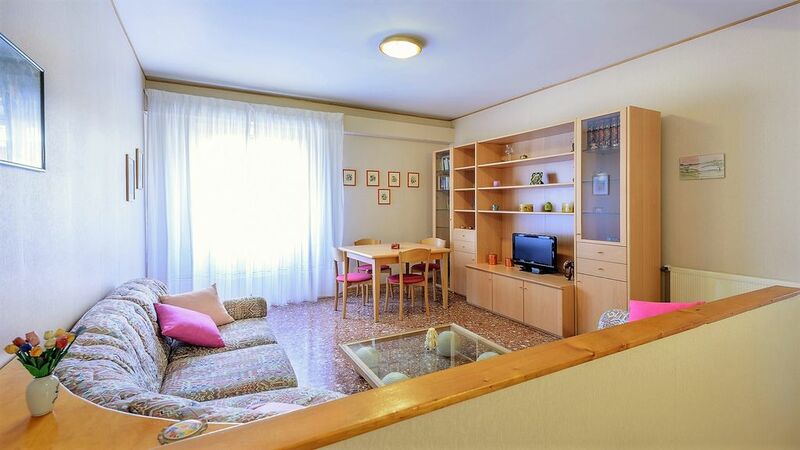 Spacious apartment, clean and neat, good kitchen and a quiet neighbourhood it is just the right kind of place for exploring all that Rome has to offer. With a clothes washer and drying rack available a very comfortable base for a longer stay.The host Anna was attentive and responsive to any and all concerns and was available virtually anytime needed. Although the wifi was temporarily an issue the host made quick and efficient arrangements to rectify the situation. One thing to note the shower is very compact. Neighbourhood is non touristy- grocery, bakeries, cafes, banks and stores all within walking distance. Vatican area is just 4 stops or so down the subway line so getting around was no problem. For those who are true walkers--getting to the Vatican area on foot is also an option--about 50 minutes walking. One tip for longer stays invest in a monthly transit pass, it is well worth the cost. It was a pleasure to host Ravil and his beautiful family, they are very discreet and at the same time very friendly and generous. They respected all the rules of the house and left everything clean and tidy. If they want to come back it will be a great pleasure to host them again. Thank you for the beatifull review. Nice place with everything you need. We took a taxi to our destinations, the location was nice. We got fruit from the markets around the corner and had breakfast. We enjoyed our stay. thanks to the nice review you left. Our 3 night stay at this property was excellent. The apartment is clean, spacious and well equipped for those who prefer to cater for themselves. The owner is welcoming and friendly. Internet was fast and the area, being in a suburb of Rome, was, unlike the chaos of the city center, very quiet. The Metro is close by, with a short ride to the Vatican and the historical center. Ospitare Riccardo ed i suoi parenti è stato un piacere. Persone molto educate, silenziose e rispettose. Sarà un piacere ospitarle di nuovo. The Courtyard of Anna is an apartment nice and bright on the first floor of a manor house, separate entrance, a quiet neighborhood, away from the busy city. It consists of a triple room and a room with twin beds and a living room with sofa bed. Front of the entrance there is a large and leafy terrace with table and chairs. The house is a 3-minute walk from the Metro line A stop Battistini, from there you can reach in just 5 minutes St. Peter and the Vatican Museums. In 10 minutes you reach the city center and places of interest including the Spanish Steps, Trevi Fountain, Piazza del Popolo and the Colosseum. In addition, the bus 46 will take you to Piazza Navona, Campo dei Fiori and Piazza Venezia. From Fiumicino you can take the Leonardo Express departs every 20 minutes to Termini and the metro line A direction Battistini. The house is also close to Villa Aurora, Villa Benedetta and St. Charles.